A washer that leaves consumers hung out to dry and a bank account offering a bad deal to customers before they're even born. These are among the worst products that have been named and shamed by consumer advocacy group Choice for failing to give consumers a fair deal. Samsung won a Shonky hat-trick after receiving the award for the third year in a row, while Westpac also earned a gong at the annual awards announced in Sydney today. Now in its 12th year, the award "winners" highlight what Choice say are just some of the dodgy products and services available on the market. While not necessarily breaking any laws or breaching regulations, Choice said the awards existed because consumers deserved better. The banking and electronic giants earned customers' fury and, hence, awards for their dubious claims and products. Viagogo, Vita Gummies, Coles, Cuddly Pain Erazor pen, and car giants including Honda, Toyota and Mazda also won a gong. Hosted by The Chaser's Craig Reucassel and Kate Browne, the awards call out Australia's worst products and services of 2017. Choice chief executive Alan Kirkland said companies were continuing to offer consumers poor value for money, hidden charges and questionable claims - and they deserved a Shonky for it. "Whether it's for targeting the unborn with a poor value savings account, financially exploiting those in pain or chipping away at kids' teeth with dodgy vitamin products, this year's winners deserve their awards," Mr Kirkland said. "For those eight companies that sank to the bottom in this year's awards, they now have an opportunity to follow the lead of previous recipients such as Ikea and Qantas and clean up their act." Choice said Westpac was a good example of a company that hadn't given consumers a fair deal. It called out the bank for using a "creepy tactic" to target the unborn though its Bump Savings account. Choice said the bank's attempt to lure in expecting parents to sign up their babies to a poor value financial product before they are even born was simply not a good deal. 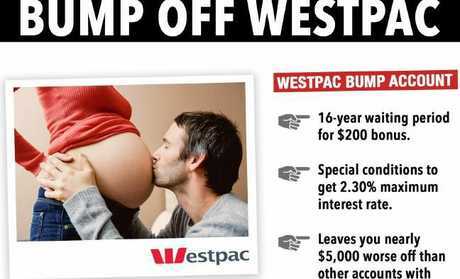 Choice head of media Tom Godfrey said that while banks targeting the young is nothing new, recruiting customers before they're born was "downright creepy". "As part of the deal, expecting mums and dads are offered a $200 sweetener for any child born in 2017," Mr Godfrey said. "But a child can't access the $200 bonus credit for 16 years and if the account is closed before then, the money is forfeited. "The shonky product also offers a meagre 2.30 per cent maximum interest rate, which is lower than many other children's savings accounts currently on the market." Mr Godfrey said the account had many hidden catches consumers should be aware of and getting ripped off was a hard way for a child to learn a lesson about money. "If that wasn't bad enough, by investing in this Westpac account until the 'bonus' kicks in and not the best rate in the market you'll be left $5000 worse off," he said. Samsung earned its third lemon gong over a washer/dryer that Choice said wasn't up to scratch. 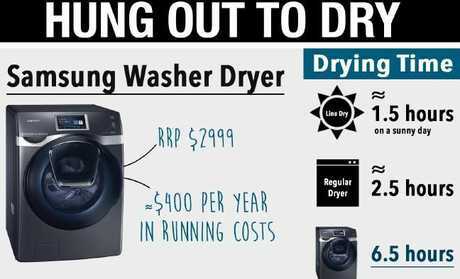 Choice said the firm's WD16J9845KG washer/dryer was expensive at $2999, took six-and-a-half hours to dry a full load, and used 210 litres of water. Mr Godfrey said it would cost consumers an extra $400 a year just to run the appliance. "In the time it takes to dry a load of clothes, you could nab a cheap fare from Sydney to the Gold Coast and dry them on the beach every week for nearly a year instead of buying this shonky product," he said. Mr Godfrey said it was a shame Samsung had been invited back for the third year in a row. Samsung was named and shamed last year after releasing 51,060 potentially dangerous smartphones last August only to recall them weeks later. In 2015, Samsung won a gong again for its "dangerous" top-loading machines which sparked a huge consumer backlash. The ticketing resale website was awarded a Shonky for "ripping you off with dodgy practices". Choice said Viagogo may see itself as a simple go-between for scalpers and buyers but illegal drip pricing was one of its questionable tactics which helped it win a Shonky. Choice also Viagogo used "tricky tactics to create confusion" and failed to respond to complaints raised by consumers. Choice questioned Nature's Way over its use of colourful cartoon characters to promote vitamins to children. 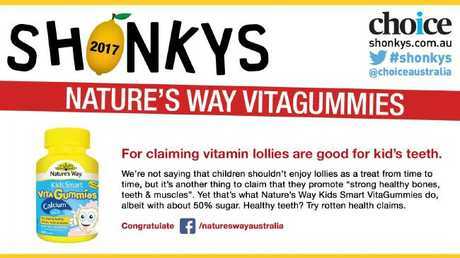 It found while the product claimed to be good for childrens' health, the "sugary treats are little more than lollies that can cause tooth decay." 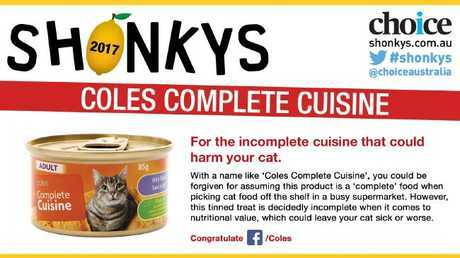 The supermarket giant earned a lemon for calling this product a "complete" food, which tricks consumers into thinking it meets all their pets' nutritional needs. Choice said the "tinned treat is decidedly incomplete when it comes to nutritional value" as stated on the can. Choice awarded this product a Shonky for "being unlikely to erase anything except your hard-earned cash." The pen claims it offers drug-free pain relief through the "science of electro-analgesia" by discharging an electrical current under the skin. Choice said at $159, the product was better used for lighting the stove top rather than being a viable pain relief option. Choice awarded this going for a fabric softener that performs worse than water while costing 3000 times more. It said the product scored the lowest out of all its tests and was also more expensive than many others on the market. The car giants shared a joint gong for failing to disclose a safety device that could actually kill drivers. Choice said the five companies all failed to notify customers about the device. A class action was launched in July against the nation's biggest car manufacturers over their role in the "outrageous" defective airbag scandal. 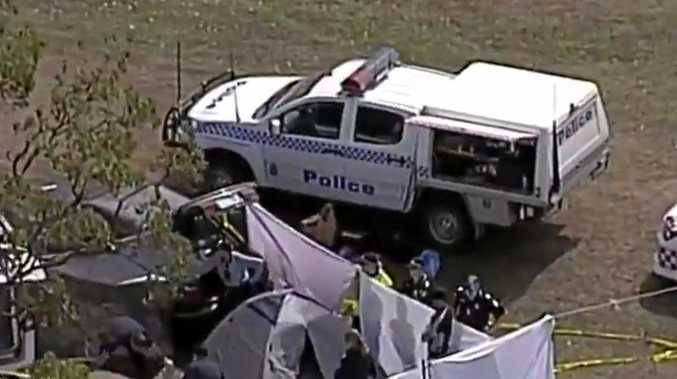 The competition watchdog launched an investigation after Choice warned Australian drivers they could be sitting behind the wheel of "ticking time bombs" because several car makers had refitted vehicles with Takata airbags, despite links to 18 deaths worldwide. The dodgy Takata airbags which can explode and launch metal shards when deployed, have also been linked to at least 180 injuries around the world. Choice said the 2.49 million vehicles affected in Australia spanned 70 models of cars sold by 14 manufacturers. However it said the five joint winners failed to disclose like-for-like replacements in recalled vehicles and the use of "deadly alpha inflators."